For the longest time, I've always wanted to set up crow braking for a glider. It just seemed so cool to take a simple 5 channel setup and do all sorts of cool things with lit, flaperons, spoilerons, drag rudders, and crow braking. Last Christmas, I received a brand new glider: The Calypso! I was instantly in love. The moment the snow melted I took it out and flew it around. It is perhaps my most favorite plane to date. The crazy thing is, only just recently have I figured out through experience how to trim it properly. And boy does it glide when trimmed right! Enough chitchat, lets get into setup! I use a cheap GoolRC GC6 as a transmitter. I flashed it with a 3rd party firmware: FlySkyI6 10 Channel Firmware. It turns the transmitter from 6 channels to a full 10 channel transmitter with 4 "extra" channels that you can access by multiplexing switches (SwA + SwB == CH11 etc.) Don't worry about the booster on the remote, that's just a 2 watt booster that you don't need. I am trying to get as long range as possible on the cheap, so I will try to max out my 2.4/5.8GHz system as much as I can. First things first, be sure to have your ailerons plugged into your receiver WITHOUT a Y harness and your flaps WITH a Y harness. 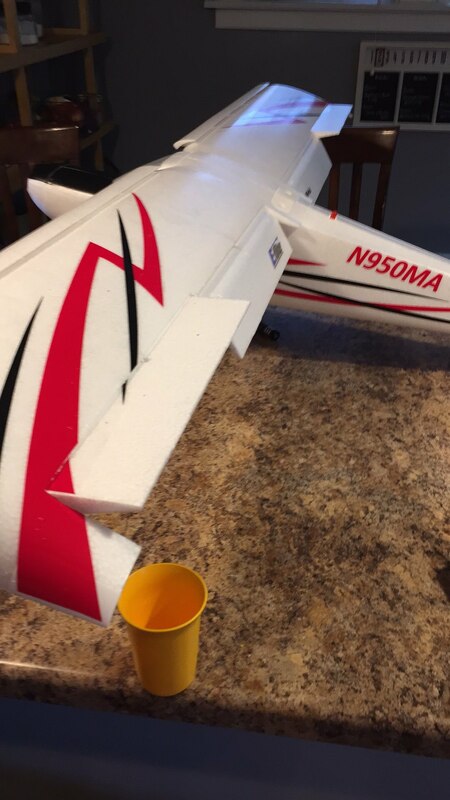 I used Channel 5 for my flaps and Channel 1 + 6 for my ailerons. We will be using Channel 1 as the MASTER aileron. Second, be sure to assign your flap switch/potentiometer. I use SwC because its a 3 state switch, -1, 0, and 1. That way, we can use each state as progressions of flaps to crow. You can use VarA/B if you wish (you can even open your transmitter and add in a potentiometer to the side if thats easier for you to get to). There are only 3 mixes available on this radio. I'm kind of bummed, because I wanted to add a drag rudder mix to it or something like that. I'll probably look around for a more advanced radio at some point, but this one will do just fine because it turns out, we need just 3 mixes. If you have ever set up flaperons for your plane on a FlySky i6 before, this picks up where that left off. But for those not up to speed, allow me to walk you through. Mix 1 is there to make the SLAVE aileron work. For some reason, every plane I've owned required me to reverse channel 1 on my transmitter so the ailerons would work correctly. This forced me to put in -100, -100 for positive and negative mixes on Mix 1. Your setup may be different. In that case, do 100, 100. If you just want ailerons and you don't have a Y harness, you can stop here. Otherwise, lets get to the fun part: setting up crow! The way crow will work on these *cheap* transmitters by adding two mixes: one for each aileron channel. I have Mix 2 set up for crow on the MASTER wing. Positive mix is the part we care about; it's what governs how far the aileron will move up. If you do -100%, you won't have any room to move the surface normally when set in crow. This is not desirable and it will potentially cause nasty crashes on landing. I put in -75% for now to allow for a bit of wiggle room, but you can change this as you need to. I also moved the aileron control rods from the lowest hole to the highest hole on the control horn to give the surface more play. The Slave mix is the part that holds the surface at 0-50% (or so it seems for this application). I have it set to 0% because at 0%, when SwC is set to the middle, the flaps come down most of the way normally with no aileron deflection. This is the normal flap mode. Unfortunately, this radio can't do expo/dual rates on channels other than 1, 2 and 4. When SwC is all the way down, thats what kicks in your crow braking. Now for the other wing! This last mix will control the crow braking on the SLAVE wing. Setup here is pretty much exactly like the other wing, just make sure to set the MASTER to your flap channel again and the SLAVE to the other wing. And there you go! You now have crow set up on your 6 channel FlySky i6/compatible radio! Unfortunately, I've discovered this summer that the Calypso is now discontinued. I had bought a second one when I heard this so I could salvage parts should I need to replace them. I really want to keep this glider in good condition because not even replacement parts are easily available. But for the time being, this plane does fly really really well! I have also been getting into the glider planes and looking at taking advantage of the currents. It took a little digging but a few weeks ago I found an older post elsewhere that helped me program crow braking. I need to play with it more before I can comment on how much a difference I notice. One other though/question would be regarding moving the ailerons down in a flaperon position instead of up and seeing how that affects lift/stalls/airspeed. I found that if you reverse your ailerons channels (1-6/6-1), you end up with flaperons. You get better lift at lower speeds, but I use the ailerons up flaps down to kill lift so I can land in narrow mountain passes. Thanks. I suppose I might want to switch from crow to flaperons so I can slow my glider some more. It cruises plenty fast enough but I would like to extend its slow side ability too. Thanks. Well hey, I’ve got a micro timber. Maybe I should give that a try there. Thanks for the idea. PS. I didn’t make it to FFOH this year but hope to catch you next year.